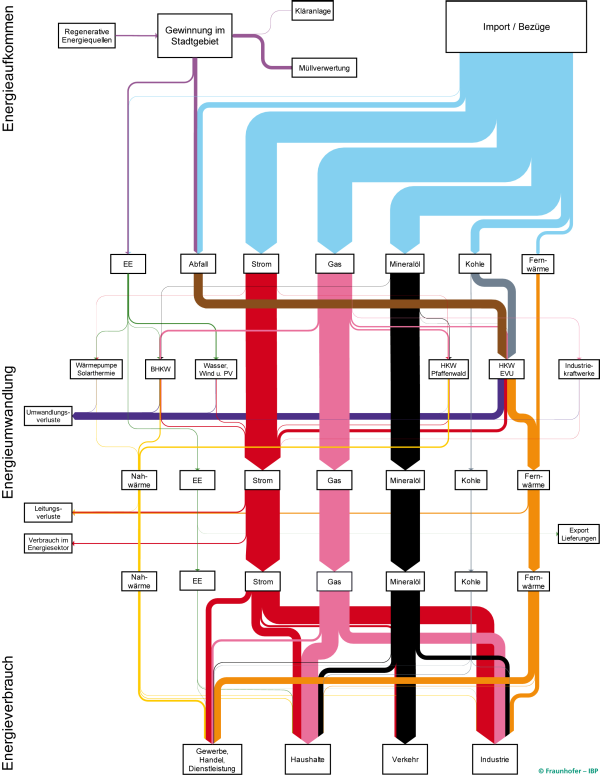 The energy balance of the German city of Stuttgart has been mapped as a Sankey diagram. This was part of the project ‘SEE Stuttgart’ (City with Energy Efficiency / “Stadt mit Energie-Effizienz”) and has been developed by Fraunhofer IBP research institute. A vertical layout was chosen. Absolute energy flow quantities are not shown in this version of the diagram, but are available in the underlying study. In 2010 primary energy consumption in Stuttgart was 20.300 GWh. The diagram is used to promote a better understanding of the consuming sectors in the city, and the types of energy used. The SEE project aims to reduce Stuttgart’s energy consumption by 20% in 10 years and to transition to non-fossil fuels. Stuttgart has actually won a first prize in a competition for energy efficient cities in 2016. It is thus setting a benchmark for other German cities. The above Sankey diagram is featured in this promotional video (in German) [at 2:36] and also briefly in this video (in German) [at 0:48] by IBP Fraunhofer. A high resolution version of the Sankey diagram can be found here. P2G: better done at home or offshore? Great find by a follower of this blog who send me a link to this report in German available on the website of the German EPA (‘Umweltbundesamt’). The title translates as ‘Climate protection and regeneratively generated chemical energy carriers – infrastructure and system adaptation for the supply of regenerative chemical fuels from domestic and foreign regenerative energies’. The report contains Sankey diagrams on 40 pages (!) like the two shown below. All of them are structured the same way with a vertical layout: a certain amount of energy available at production site, losses branching out to the right, and useful energy available on site shown as the remaining arrow at the bottom (colored in green). From the management summary in English we learn that “this project aims at gaining first insights into the potential of renewable chemical fuels from renewable energy sources both domestic and abroad as well as the associated transport requirements. (…) [P]otentials and transport infrastructure for using renewable energy to provide storable energy carriers were analysed, being followed by a systematic comparison of the import routes of renewable gases, namely hydrogen (eH2) and methane (eCH4)”. The assumption is that there are countries (e.g. Norway) that may have wind energy in excess, and regions (e.g. Turkey, Spain) where there is abundant potential for solar energy (PV). This electricity could be used for methanisation (power-to-gas, P2G). Gas from renewable energy could be stored in the German gas grid. 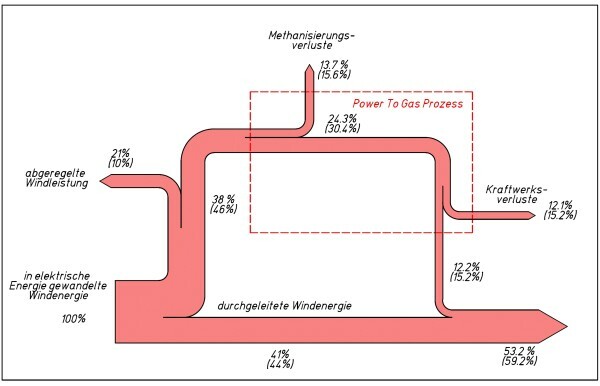 The Sankey diagrams then show power-to-gas transformation on site and transporting the gas through pipelines to Germany, compared to the scenario of transporting electricity on the grid (with the associated losses) and to produce methane in Germany. ‘Klimaschutz und regenerativ erzeugte chemische Energieträger – Infrastruktur und Systemanpassung zur Versorgung mit regenerativen chemischen Energieträgern aus in- und ausländischen regenerativen Energien’ by Stefan Schütz of DBI Gas- und Umwelttechnik, Leipzig and Philipp Härtel of Fraunhofer-Institut für Windenergie und Energiesystemtechnik, Kassel. Report published Aug 2016 by German EPA (Umweltbundesamt, UBA). Download full report PDF here. Thanks Axel from Germany for pointing me to this. Here is a good example of how Sankey diagram and pie chart are used side-by-side. In fact, the Sankey diagram picks up one particular piece of information that is already in the Sankey diagram. It compares a conventional process with a new, energy reduced process. Here is the Sankey diagram for the conventional process and the pie chart right below. The unit is kWh/kg, primary energy per kg of final product. The three colors are picked up again in the pie chart that shows the breakdown of primary energy lost in the provision of heat (brown, 12.3%) and in the ovens (red, 74.3%). Only 13.4% of the primary energy is actually used for heating of the rolled material (yellow). Now, the pieces of the pie chart correspond to the widths of the brown, red and yellow output arrows as part of the primary energy input at the left. We are, however, typically much more used to percentages being represented in a pie chart. A rather simple Sankey diagram. It can be found on p. 195 of a study on Food Waste in Germany by ISWA, Stuttgart University comissioned by the Federal Ministry of Food and Agrriculture (BMEL). Flows are in million tons per year (averaged for the five-year period 2003 to 2007). The yellow streams represent food delivered to individual housholds (“Haushalte”) as well as to commercial (large scale) users (“Grossverbraucher”) such as restaurants. The orange arrows show food waste (10 mo. tons p.a.). Note that individual households have a higher reject rate. What happens to yard waste and biowaste in Germany? This Sankey diagram from a 2014 PowerPoint presentation titled ‘Flächendeckender Ausbau der Biotonne in Deutschland’ by Peter Krause and Rüdiger Oetjen-Dehne (u.e.c. Berlin) shows how these flows were distributed. In 2012 there were 14.5 mio. tonnes of yard waste andd 6.6 mi. tonnes of bio waste (kitchen/food waste) were disposed of in Germany. Much of it was collected and treated or – such as in the case of yard waste – composted (7.8 mio. tonnes). In addition to the absolute quantities the labels along the Sankey arrows show the average per inhabitant (kg/E, a). A large potential is still in bio waste (orange-coloured arrow) being disposed of in regular household waste (“Restabfall”). Calls for separate collection of bio waste for energy recovery are being made. Interesting comparative Sankey diagram on page 16 of the 2012 environmental declaration of Rosenheim Stadtwerke (Rosenheim City Power?). The city is building or already running a wood gasification plant. Instead of just using the heat from directly burning wood (with 30% energy loss), they decided to work with a wood gas carburetor and use the wood gas to run a gas motor. This is somewhat similar to CHP where heat and electric power can be produced. Overall loss of energy (“Verluste”) in the system is only 23%. The green box at the bottom displays the avoided fossil GHG emissions per tonne of wood for both technologies. Flows are in MWh, but only some selected arrows are labeled. Unfortunately the flows are not always to scale: yellow arrow “Wärme” (heat) in figure at top representing 3,15 MWh, but shown as half the width of the blue arrow 4,5 MWh. I reckon the diagram was build manually from rectangles and triangles.